Using almost 90% less electricity than standard bulb, lasting up to and beyond ten years, and producing an even spectrum of light that is unparalleled; the future of lighting is Light Emitting Diodes LED. 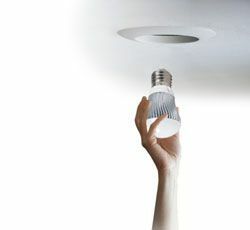 Market studies predict that by 2040 LED will have replaced all other sources of artificial light in the developed world. When LED are universally implemented there will never be a need for another power plant. By far LED are the most dramatic change and realistic way for each of us to conserve energy and save our natural resources. The future of lighting has arrived, more affordable and energy efficient than ever. Today more companies, business, governments, cities and homeowners are looking for ways to cut costs and preserve our precious natural resources. LED is the answer and LED* SAVE30 team have been working on better ways to answer the question every year. The culmination thus far of that task you hold before you; LED for every application, possibility and situation. With our ability to customize and design to your specifications and desires there is no reason not to incorporate this new standard into your project. We provide high quality LED full range product, LEED project Certification, energy efficiency aduit, upgrade strategies, supply, installation, and Turn-key commissioning, which can satisfy all your needs in industries, commercial, interior, exterior full project system integration.